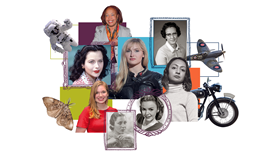 The IET's new exhibition focuses on women in engineering, past and present. The Institution of Engineering and Technology (IET) has launched a new exhibition at its headquarters in London, which celebrates and showcases women in science, technology, engineering and mathematics (STEM). The launch coincides with Ada Lovelace Day, held every year on the second Tuesday of October, which recognises the most inspirational women in STEM. It is a celebration of the achievements of women in STEM, aiming to increase their profile and, in doing so, create new role models who will encourage generations of girls into careers and support women already working in STEM. The new exhibit in the Mountbatten Exhibition room at the IET, will be showcasing current winners and finalists of the IET’s Young Woman Engineer of the Year (YWE) Awards, highlighting the breadth of engineering in today’s society. Guests and delegates can also see what initiatives the IET is working on, including its recent #SmashStereotypesToBits campaign, the Portrait of an Engineer photography series and its work to highlight the inspiring career paths and amazing achievements these women engineers have accomplished. An exhibit in the Watson-Watt room will focus on women in engineering and their contribution to the field and will be a retrospective look at the rich history of women in engineering, celebrating the trailblazers, women on the move and discoveries made by women.